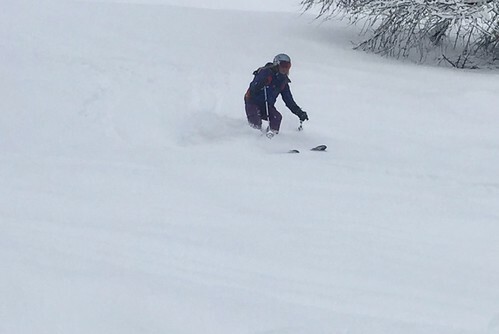 Serre Chevalier Snow Report 2017/2018-and useful links. That’s really sad. Saw this in the times earlier. Last couple of days Spring has arrived in the valley and I've been touring on the South facing slopes above Monetier where you climb up pass Chapel St Anne. 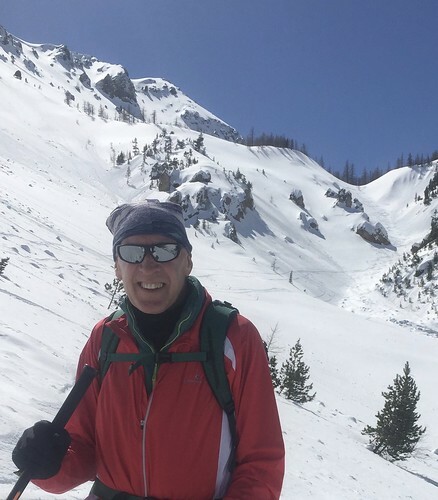 Yesterday snow was not quite soft enough above 2,100 but with yesterday's warmer temps and overnight freeze then we had classic Spring snow pretty much all the way skiing right back down into Monetier. Temps on the patio this afternoon in the direct sunlight were in the mid 20's so tomorrow should be even better! 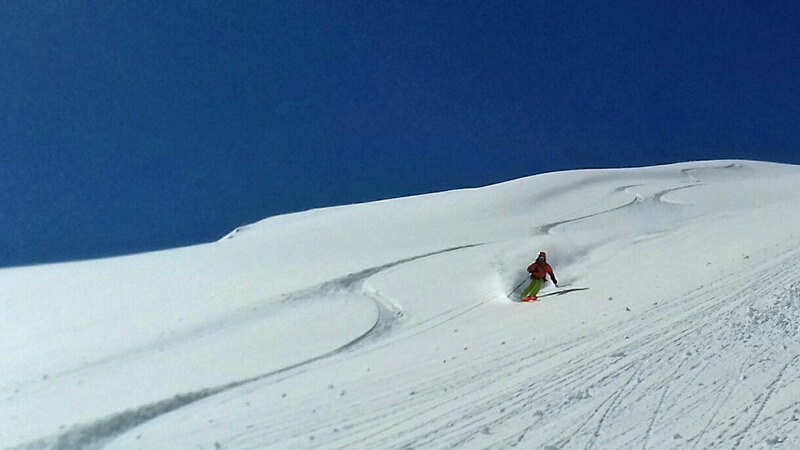 And sweet sound of skiing spring snow. Been thinking about it for many a season - and that is to try a good pair of full on Slalom Carvers. I do have an old pair of White Doctor piste skis that do hold an edge, but not to the same degree as you see people hackin around on. With a forecast that is not actually happening as it were best option to take one day at a time and today started off without a cloud in the sky. So armed with my Völkl SC Race Tiger Uvo 170's I was borrowing met at the CDB and we skied nigh on deserted superbly groomed pistes off the Clot Gauthier. I really don't think piste skiing can get any better than that. I gradually dialed into the skis and started to let them run. We then headed over to Grand Serre and coming off there on our way to Prorel I misjudged a bend as I thought we might be going straight on so tried to make the bend at the last minute but failed and shot off the piste, luckily into the soft snow, major wipeout with friends saying it was 9.5 out of 10. 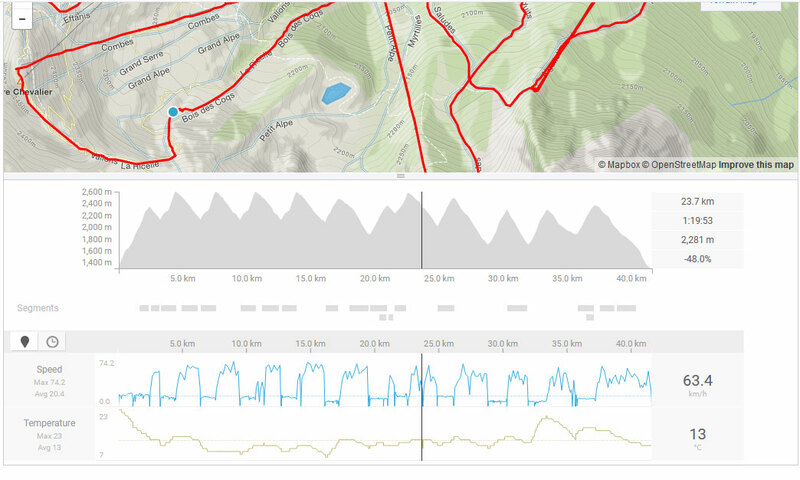 My Strava shows I was doing nigh on 64kph as I flew off the bend in the piste. Head, neck and shoulders a wee bit stiff but luckily I was wearing a helmet, which those that know me know I don't usually wear one, but I did suspect that I might be skiing faster than normal on skis I'm not use to. We did a few more runs down deserted pistes to the Aiguillette. Then sky started to haze over so plan which was to go back home and then go back up a couple of hours later to go and look off the back of the Col de Mea has been postponed. Nice !! Will snow depths reach the magic 4m? 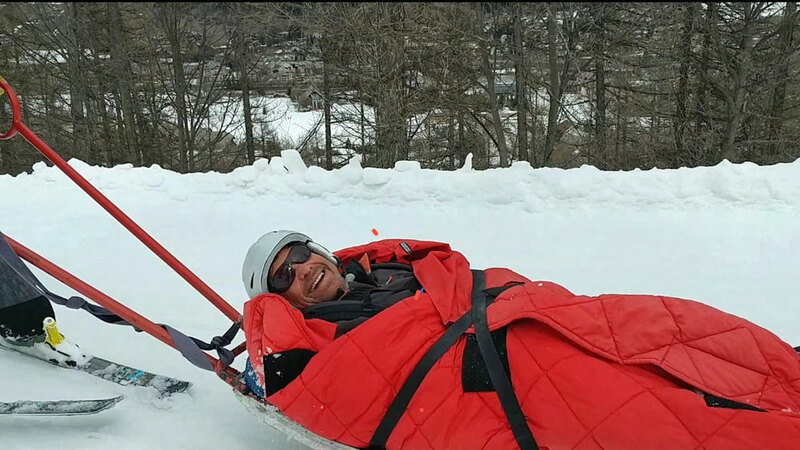 https://www.serre-chevalier.com/hiver/enneigement/ . Showing 395cm at 2800m today. Looks like it was nice when we left on Sat morning. Sadly I was outvoted 3:1 and we had to hit the road instead of squeezing another bit of skiing in.. When we drove over there were a few people parked up and getting geared up for a spot of touring, it looked great up there. I was quite jealous. @Hells Bells, move a snow machine? 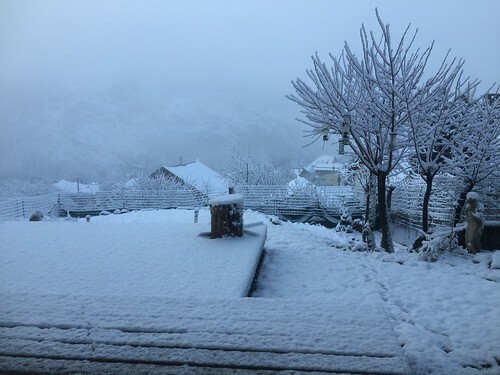 Lots of snow in Serre Chevalier and more snow above 1900 metres yesterday but rain below. Not much fun skiing lower down by yesterday afternoon. Have kids starting to drag me down black runs . Woken up this morning and weather looks a little better than expected. @BertieG, that's quite amazing - not a clap over here ! We’ve had it all today; started with snow, turned to heavy rain, thunder, lightening, blizzards, closed the lifts, sun comes out! Back to heavy sleet now with rumbles in the distance. Forecast is good for tomorrow though, fingers crossed. Definitely heard thunder at Pointless this pm! Looks very wet snow/ sleet at 1500 metres. Was chucking it down with rain in Briancon a couple of hours ago. Suspect the snow line is around 1700/1800 metres. I see it did reach the magic 4m this morni g at 2800m. "Should be a fair amount of new snow higher up"
Total climb to our high point was 600m approx. The final skin up the visible couloir was surprisingly long and steep (guidebook S3: 30-35 degrees). 300m above where the photo was taken. Ken got the short straw for those hard yards! Somewhat disappointingly, while we had the valley to ourselves on the way up, we met three skiers traversing the col from the south (Serre Chevalier) side and they got to ski the steep couloir first. But hey ho there was space for everyone to have their own track. 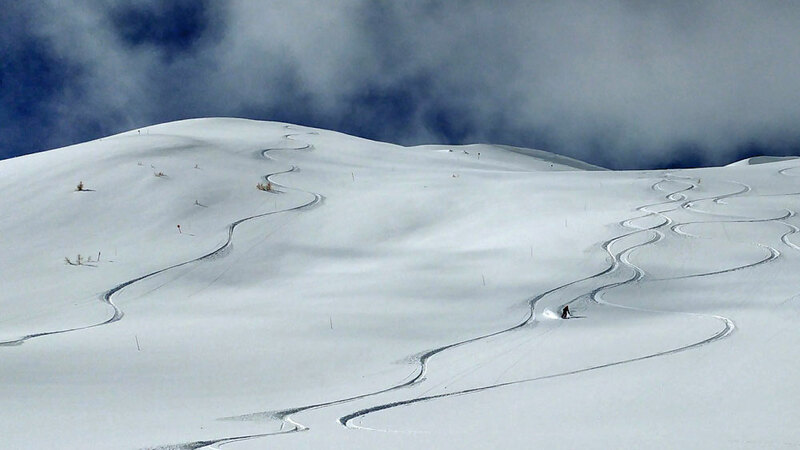 Final day of operation of the Prorel sector of Serre Chevalier is tomorrow Sunday 8th April. Seems a shame when there is still so much snow but these things have to be planned well in advance. News for next season, a new 6 seater chairlift to be installed. I assume this will replace Cote Chevalier and Pré du Bois. @KenX, not according to what I've seen elsewhere. I think Frejus chair might be coming out too. Pointless will then be even more pointless. Had a great week in Serre Chevalier. Many thanks to Ken for putting together a willing band of helpers to assist me skiing with my daughter. Met some great people and had some great times including riding s sit ski in powder for the first time. @Hells Bells, not quite true - they have big plans* for the area below us including a new lift at Pointless, subject to further development. You have to remember there's a little thing call Club Med that they have to take into account! Though elsewhere it does say Frejus and Pre du Bois drag will be scrapped, but how do you get 1,200 Club Med clients up the hill, unless they get off Pointless and ski down to CDB but can't see that happening. *taking out the equestrian center and the ice racing circuit, according to an estate agent!! The new chair will start just above skid alley (top of Lacets) and finish where the Cote (slammer) currently finishes. Then proposed works are: used Google translate but the basics are there to be worked out. Some of the logic for replacing chairs with gondolas is due to the threat of Global warming and people in the far off future taking lifts down on a more frequent basis! The new DSP linking SCV to the communes of Salle les Alpes and Monêtier les Bains has been signed. Future investments are conditioned by the creation of hotel beds in these municipalities. 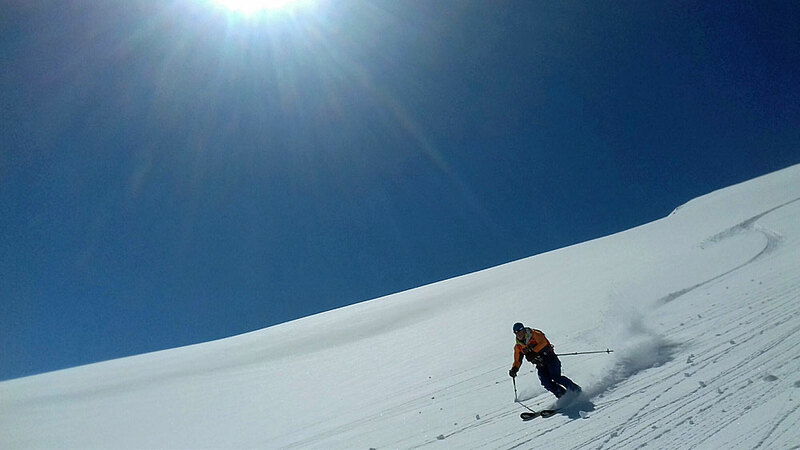 "It provides € 134 million investment from the delegate (Serre Chevalier Vallée - ski area, 100% subsidiary of Compagnie des Alpes), These investments will be essentially grouped over the first 10 years and include a share of 83.5 million € which will be devoted to ski lifts and spent as 2,600 new hotel beds are built. - The replacement of the DMC Pontillas by a modern gondola arriving at "La Fermière" as soon as the planned construction of 800 hotel beds in Villeneuve will be initiated. - The replacement of the Bachas chairlift with a modern gondola lift as soon as the planned construction of 1,400 hotel beds at Le Monêtier is underway. - The replacement of the chairlift of Eychauda by a detachable chairlift (6 places) arriving directly at the col de Cucumelle. - Other modernization operations concern the Aravet gondola lift and the Yret and Casse du Boeuf chairlifts (this one being eventually replaced by a gondola lift). - During these operations will be dismantled the chairlifts of Fréjus, Cucumelle, Aya and Lauzières as well as the gondola Frejus. 2019 : L'année du Monêtier ! Réaménagement du front de neige avec un tapis roulant et le remplacement du TK de Pré Chabert par un TKE. TSD du Col de l'Eychauda. TSF de Cibouit avec tapis (déplacement de l'actuel TSF du Col de l'Eychauda). TK versant Pelvoux du col de l'Eychauda. TC du Pontillas - sous réserve de 800 nouveaux lits chauds. Liaison Sporting - sous réserve de 200 nouveaux lits chauds. Réaménagement de l'espace débutant de Fréjus. Luge hiver/été sur le front de neige de l'Aravet. Réaménagement de l'espace débutant de l'Aravet. Gros travaux de neige de culture. TC du Bachas - sous réserve de 600 nouveaux lits chauds. TC de l'Aravet (la TC actuelle aura 50 ans). Téléporté de Méa - sous réserve de 350 nouveaux lits chauds. Téléporté de la Casse du Bœuf - sous réserve de 350 nouveaux lits chauds. Attendre encore 10 ans pour avoir un téléporté à Méa, ce serait malheureux. Les TK des Barres et de Méa auront 59 ans en 2027 ! Le TS de l'Yret ne fait pas partie de la DSP, c'est la raison pour laquelle il n'apparaît pas dans ce programme. Il faudra cependant bien le remplacer à plus ou moins brève échéance (j'espère, à brève échéance) car il a déjà 33 ans. De même, et bien que ce soit moins criant, il faudra bien, à un moment donné, rénover ou remplacer le TSF de la Cucumelle. Quid du TK du Clot de l'Étoile ? La DSP ne prévoit rien pour les pistes (Combettes, Goudissard, Tabuc, etc.). And as for the weather - looks like road trips on the cards to make the most of the Retour Est - Sestrierre now an option as faster to get to than Abries and it closed yesterday. But it does look grim for this week payback now for all the powder we had. @Weathercam, feeling a bit like that myself. Weather in UK has been pants for the past week. We're off to VT on Friday, but right now I just feel like heading south to the Med instead. Just been looking up there as we have a clear view to top of Pointless and Frejus chair and it makes no sense to have the new lift started 100m up skid alley when the most logical thing it to have it start top of Pointless ??? Then the question is how would you get all the little Club Med toddlers on to the the Frejus Mea Meadows, bus them to Frejus gondola ??? Going to be interesting !!! Might try and have a conversation with Dominic* if he's in the Cocoon, he's the surly git who is head honcho of Villeneuve ESF and bought it from Eric last year, but no doubt there will be a major element of Lost in Translation and shrugging of shoulders. @Weathercam, Pointless will certainly be less pointless if it is going up to the Fermier. There has to be a survey and an actual plan as work will start soon, of course after they move all the snow that's going to be up there for a while. Might be worth popping into the Pi Mai and asking them, but that's probably shut as well. Anyway we'll soon see in the summer exactly as we're always up and down there. Back in January, @dan100 came to stay with LynnX and I (and the dogs) for a long weekend in order to take his sit-ski qualification so he could take his daughter Sophie out without an instructor in tow. 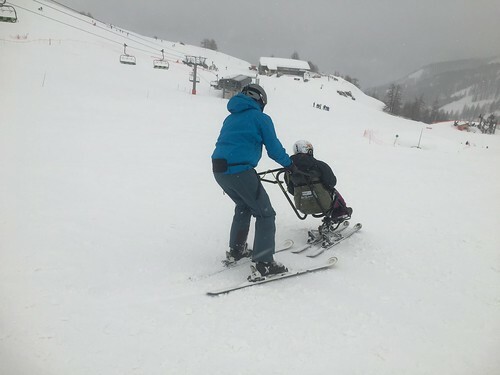 Happy to say he passed first time and Dan then contacted me to say he was returning to Serre Che over Easter with the family and could I organise some help to shadow him on his first week with a new sit-ski and help getting on and off the chairlifts. 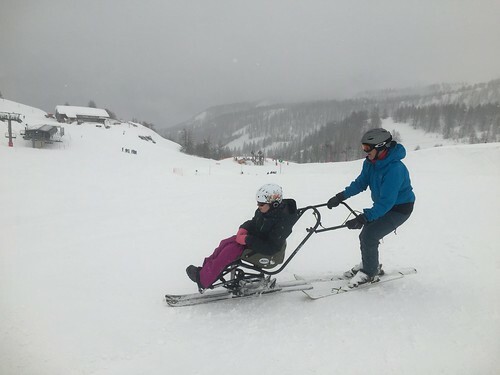 Wow, I was stunned by the effort and attention one has to pay to oil the wheels of this machine, even getting Sophie's wheelchair across the soft snow to the chairlift was hard work! But, I have to say, massive chapeau to Dan, all his efforts have paid off and boy, can he drive a sit-ski! So yesterday, rain in the valley turning to heavy wet snow and quite heavy at times. Game plan was to go up after lunch and see what it was like. 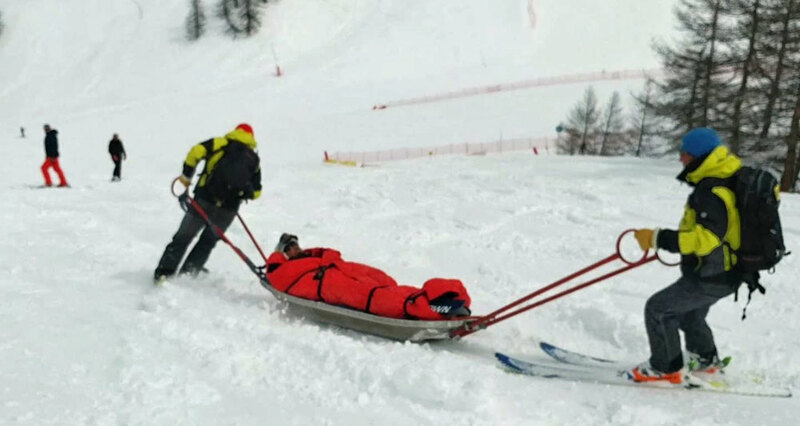 Had a mate who was driving back from Turin having dropped his OH off who was flying back to the UK to see her knee consultant after many issues following on from a knee replacement, that said things were looking up as the past week or so she had ventured back on to skis. 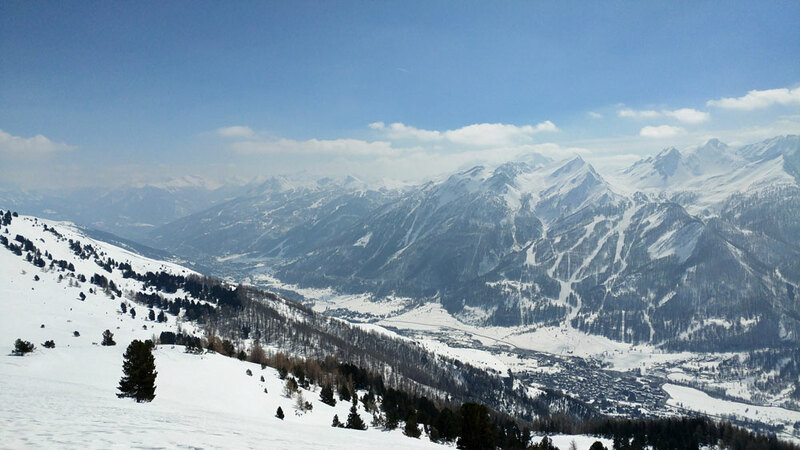 Steve posted various images as he was going over Montgenevre and with the weather clearing the WhatsApp was buzzing. We went up from the Casse at 13:00 and was evident that there was 5-10cm of fresh. We skied down and took the Gauthier up and decided to ski down the face under the lift as it was still quite untracked. However it was tough going with not a lot of fresh on a real crusty cruddy base and I was having to work hard to try and ski it well. The others found it tough and they are both at that level when they need to ski tougher conditions to get the most out of it when it's good, always a catch 22. The trouble is that for one of them, that particular day was not the right conditions to be invoking "speed is your friend" and as I was back down on the piste talking to one of our party who opted to take the piste down, out of the corner of my eye I saw Steve stack it at speed. The rest of the group came to his aid, and at first we thought there was gear failure as one of them skied back down with a ski whilst Steve came down on his bum. He said that Steve had hurt his knee, but lower down off the slope Steve was walking through the knee deep soft snow not too bad and we all thought he was ok.
After a rest he put his skis off and went to ski down with me behind him, but as he went to put a slight turn in he just collapsed and said he felt his knee go, he then tried to stand up and it went again, with that I said to him I was off the get help and to the others to put X skis up. He saw the doctor just down from the Frejus who examined him and after various tests told him it was 90% ACL rupture but MRI would confirm.